This summer we called on drum corps fans to "spread the word" about drum corps to the uninitiated - invited longtime fans to become marching music evangelists. Dave Mayrand sent in this one. 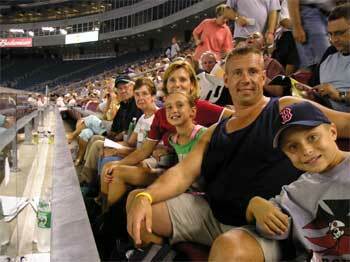 "This is the Mayrand family at DCI Finals in Foxboro. The new converts are my daughter Kelsey and my son Kyle. They are 10-year-old twins and this is their first finals. "My family and I attended all three days of competition. Others in the picture are (far right) Joe Mayrand and then Faye Mayrand -- they are my parents from Ishpeming, Mich. My wife, Linda Mayrand, is next, along with me. My family and I are from Rocklin, Calif., which is a suburb of Sacramento. For my parents and I, our first finals was in 1973 in Whitewater, Wis. My wife's first finals were the last time DCI was in Boston, in 1994. "My father, Joe Mayrand,,started and ran the Ishpeming Blue Notes in Upper Michigan in 1957 and ran the corps into the early '70s. I played with them through the mid-'70s. The Blue Notes went inactive as a Junior Corps after the 1976 season. They today still operate as a local senior corps, staying local in Upper Michigan playing parades and other outings. "I attend DCI finals every year no matter where it is, though I must admit between Denver and Foxboro for the last two years, DCI has made a good choice in these brand new stadiums." Thanks Dave! We realize the summer is over, but if you brought a "new" drum corps friend to a DCI show this past summer, send us a pic and we'll acknowledge you! But then this winter, you've got to promise to keep those drum corps passions burning, and inspire your new converts to bring friends to DCI shows next summer!